To do this we create some simple class with which we represent an e-commerce orders management system. So we will have orders, customers, the list of the items included in the order, with their quantity, price, etc .. So, let’s start to define the classes we need. We start from the Order class that will contain the order identifier, the customer who placed the order, the list of the lines that compose the order, the total amount of the order and the date on which the order was placed. We have redefined the toString method to obtain an explanatory text representation of our Order objects. At this point we define the OrderItem class representing individual lines of an order which will be constituted by the purchased item, the relative number of pieces and the total price for this row, given by the multiplication between the quantity and price of each item. We continue in the definition of classes with Item, which simply represents an item available for purchase. His fields are an identifier, the name of the object itself, its category of membership and its unit price. The category is represented by an enumerator that we will define shortly after. Finally, we define the Customer class, which represents clients that we identify simply by an id and their name and surname. Ok, now let’s go back to our goal, which is to provide an example of JSON serialization with Jackson. Once we have added the libraries to the project, we modify our test program to perform the JSON serialization of our Order object. What we need to do is to create an ObjectMapper and invoke its writeValue method, passing as parameters the stream where to write the value (in our case System.out, the standard output) and the object to be serialized (our Order object). Displayed in this way, the string isn’t simple to analyze and for this reason we ask the object of ObjectMapper to format the output in a more readable way, just for verification purposes. As we can see our Order object is represented by an associative array of key-value pairs, enclosed in braces. The first field, “id” is a primitive type so that its value is just reported. The field “customer” instead, consists in an object of the Customer class, so in the serialization process as a new object is defined, opening a new brace, inside of which are represented the Customer object attributes. The next field of the Order class to represent in the JSON string is “itemList” which at the class level is defined as a list of OrderItem. The lists are represented in JSON within square brackets, so in our serialization string we have the field “itemList” displayed by a pair of square brackets within which are listed, separated by commas, the representations of OrderItem objects. Each OrderItem element, being an object of a class, is enclosed in curly braces and contains the fields “quantity”, “it” enclosed in braces because, again, is an Item object, and “price”. Finally the Order object provides the last two simple fields, “total” and “placedDate”. On this last field, representing the date on which the order was placed, we notice something strange. The date is represented in the “computer age” format, so as the number of milliseconds since 01-01-1970. To give it a more readable we have to act again on our ObjectMapper object, setting the desired format. "placedDate" : "15 dic 2014"
The result is the same as before, when we wrote the JSON directly to standard output by the method writeValue. At this point we have our JSON saved in a String, so we can try to make deserialization using the readValue. We modify our test program telling it to create an Order java oject starting from its JSON representation saved in the string. This means that we must indicate which constructor we want to use to instantiate an object of Order class, starting from its JSON representation. To do this we must annotate the constructor to be used with the Jackson annotation “@JsonCreator” and annotate every constructor parameter with the Jackson annotation “@JsonProperty” combined with class property that parameter maps. You may want to consider json-io (https://github.com/jdereg/json-io) or gson (https://code.google.com/p/google-gson/) instead of Jackson for JSON serialization. Both handle templates and interfaces much better than Jackson. Both libraries are very fast. 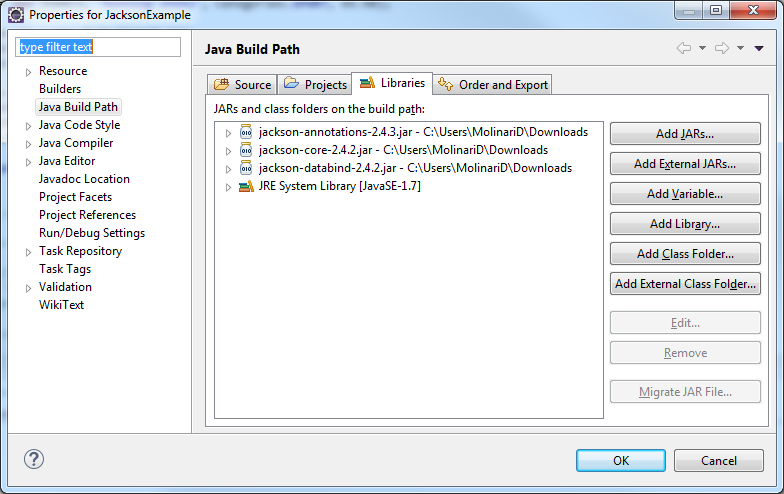 Json-io is less than 100K library with no dependencies on other libraries (JDK only). Hi John, thank you for your suggestions. I already know gson and I’ll take a look at json-io too. I see it’s your own project, so congratulations!